An infiltrating ductal carcinoma of human breast tissue, magnified x330, is seen surrounding a normal duct (1). 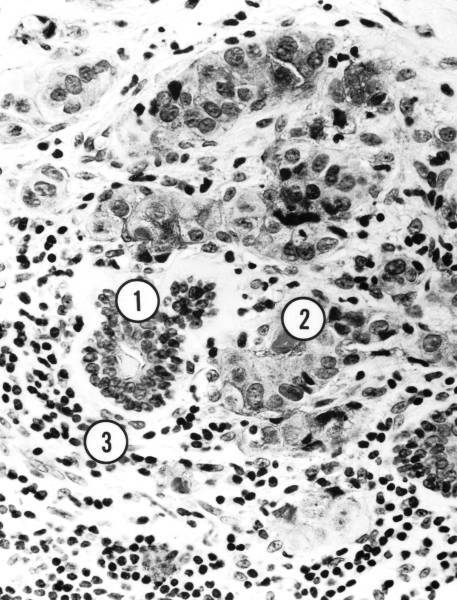 The cancer cells (2) are larger and more irregular than their normal counterparts (3). The cytoplasm of the tumor cells is stained with a monoclonal antibody which recognizes a carcinoembryonic type antigen (cea) found within the malignant cells. The monoclonal antibody was developed in the NCI research laboratory of Dr. Jeffrey Schlom.